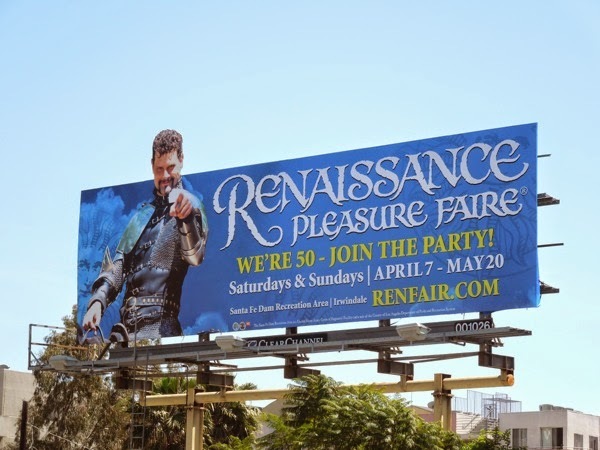 If you're a fan of Medieval Times and the world of castles, brave knights, fair maidens and foolish jesters, then you're in for a real treat with these billboards for ye olde Renaissance Pleasure Faire. 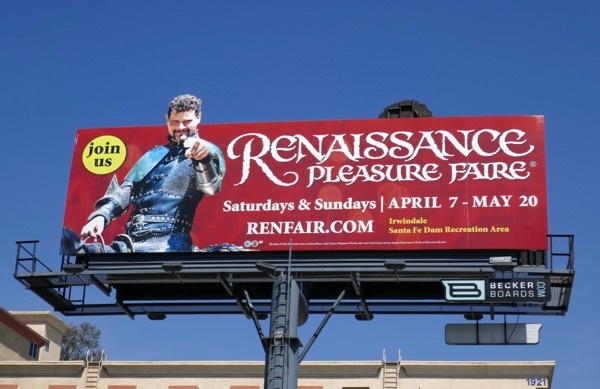 This historical-themed festival at the Santa Fe Dam Recreation Area in Southern California is 20 acres of armoured jousting, feasting, marketplaces, rides, games and entertainment, all fit for a Queen's court. 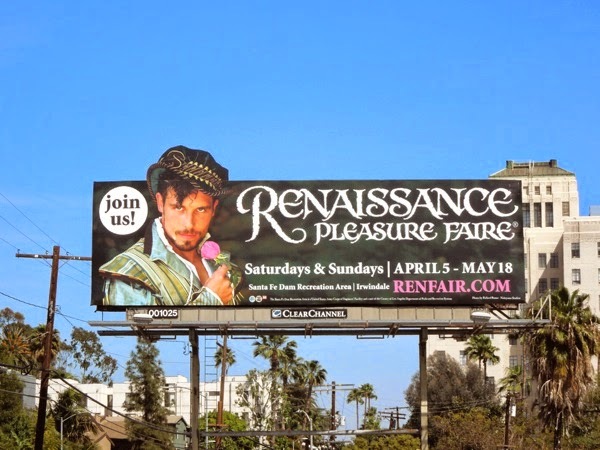 This romantic Shakespearean looking fellow was snapped along Highland Avenue in Hollywood on April 3, 2014, whilst the horse-back knight billboard version was spied on April 16, 2012 at the same busy intersection. 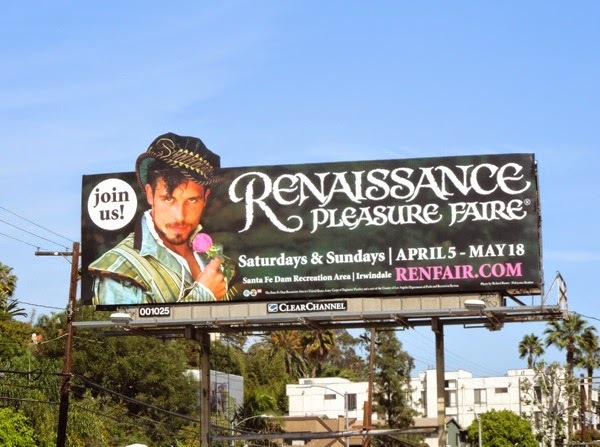 Looks like it's time to put on your best Renaissance costume and step back in time for the day. 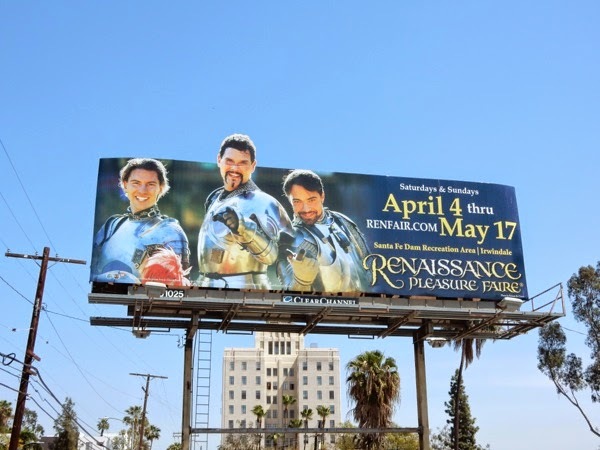 UPDATED: How quickly time flies, as here's the 2015 ad creative for the faire which features three shining knights (for the price of one), spied in the same Highland Avenue location as last year on April 2, 2015. 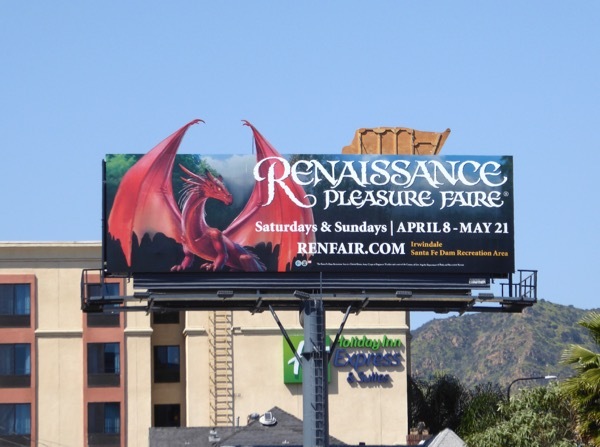 UPDATED: Another year later and here's a new creative for the Medieval faire, this one with a cut-out dragon head special extension to help catch your eye, spied in the same Highland Avenue ad location on March 23, 2016. 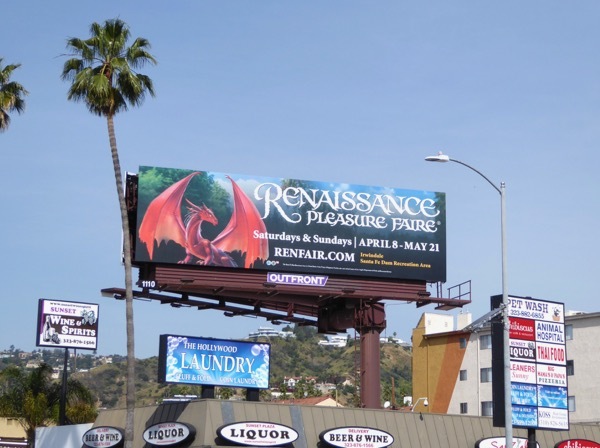 UPDATED: In 2017 the annual faire was embracing the fantastical with a new winged dragon ad creative. 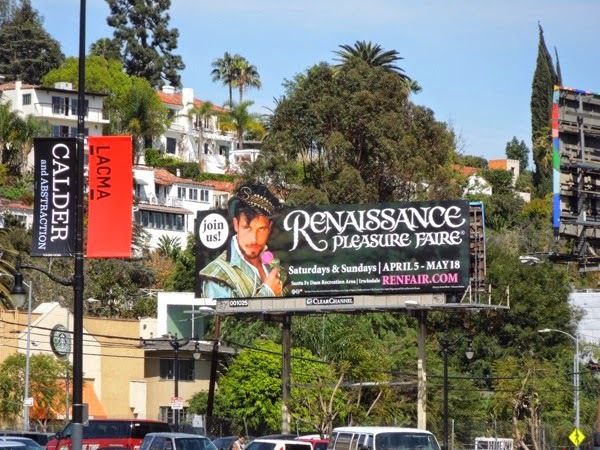 The special extension cut-out was snapped along Highland Avenue on April 9, 2017, whilst the standard landscape version was spotted the next day along Sunset Boulevard. 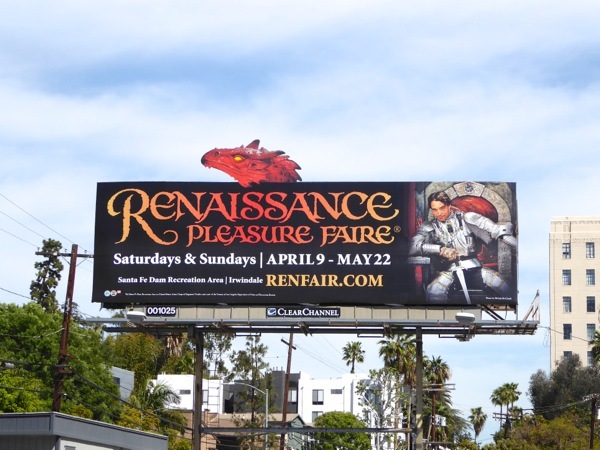 UPDATED: It looks like the faire is recycling some of their old images as this is the new 2018 version using the old knight from 2012 with a red background instead of the blue. This billboard was snapped along Highland Avenue on March 29, 2018. UPDATED: It appears the past as well as the future is female, according to the latest faire ad creative. This billboard was spied along Highland Avenue on March 14, 2019. 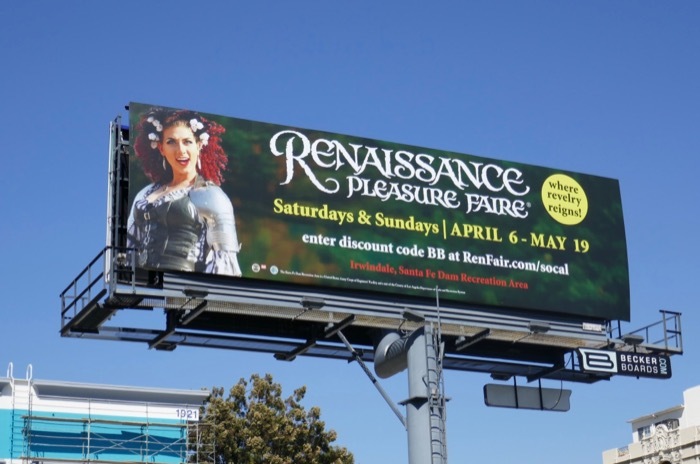 Plus here's a different extension cut-out billboard to attract wenches and their admirers, spotted along Cahuenga Boulevard on April 17, 2019.